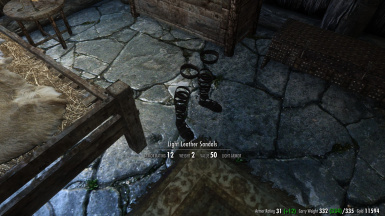 Adds a craftable pair of leather sandals to the game. For Females only. UNP, CBBE(Curvy) or UUNP. Also an optional replacer. All Credit goes to tiwa44, for his UNP Minidresses mod. 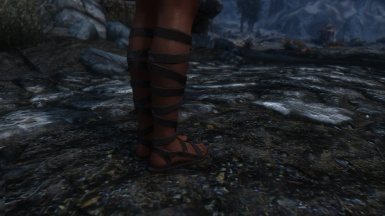 Light and Heavy sandals can now be tempered. Fixed the bone weight problem and clipping from previous CBBE version. Removed the severed feet from the item preview. Will now appear on males as moth priest sandals. Added Heavy and Light versions. 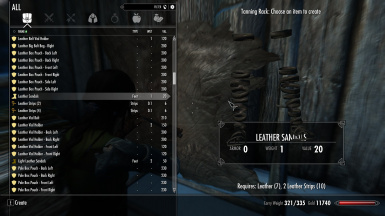 A standalone mod which adds a craftable pair of leather sandals to the tanning rack. It has Heavy, Light and Cloth versions. For females only. 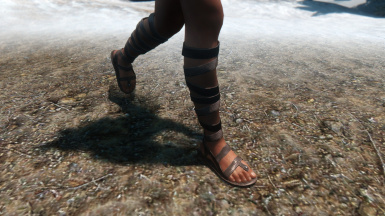 There is also an optional replacer that can replace many of the shoes that female NPC commoners wear with the leather sandals. Won't effect male shoes. UNP Minidresses Collection by tiwa44. Also edited the mesh for a CBBE and UUNP versions. Requires UNP, CBBE(Curvy) or UUNP. UUNP version might not fit properly on custom leg shapes. Only use the default presets with this for the time being.